Editors Note: The following book review has been borrowed from the “Missing – Lynx” armor modeling web site. For those of you not familiar with this site, please visit them at www.missing-lynx.com The top armor modelers in the world contribute to this great site on a regular basis. Packing a 106 page punch this latest in the series of books form the Nuts and Bolts team is a real winner. Obviously published in mind of Tamiya’s recent release, the N&B team knows that this little gem of kit is hard to resist and that many modelers have more than one sitting on their shelves awaiting the right references. Well, the wait is over and the reference has arrived. The book begins with 24 pages of developmental history, combat history and unit allocations. The way in which the unit allocations are dealt with is excellent. Each unit which has been identified with fielding the Marder III has been giving both a paragraph detailing the unit’s actions as well as a table showing all the units and the quantities allocated. Very handy. The next 21 pages are, in my opinion, the best part of the book. 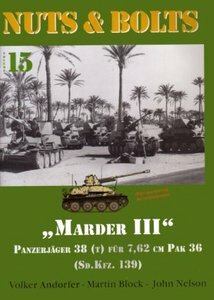 Photo after photos showing the Marder III in action on all fronts, most of which have not been published before. There is some spectacular stuff here, including photos showing all 3 types of travel locks. There is enough variety in these photos to model a dozen Marders in different schemes: gray, desert brown, winter whitewash, gray with dark yellow overspray, plain dark yellow, dark yellow with one secondary colour and dark yellow with 2 secondary colours. Fantastic! This is followed by 2 pages of 1/35 scale 5 view drawings plus 2 drawings showing details with the gun removed. The “centerfold” is 4 pages of colour plates showing 8 different Marders. The final section, as per usual in any Nuts and Bolts book, is 58 pages of detail photos of the Aberdeen and Saumur Marder IIIs as well as detail photos of the towed 76.2cm AT gun (there are 2 pages of 1/35 drawings of this ordnance also). The variety and scope of these images make them essential to anyone wishing to superdetail a Marder III and are exactly what we have come to expect form the N&B team. Speaking of superdetail, the inside front and rear covers of the book features colour photos of Brian Well’s unpainted Marder III which features scratchbuilt detailing beyond what most sane people would attempt (this model was also featured in Military Modeling a few years back). Overall, an exceptional book and essential to any considering building Tamiya’s great kit.